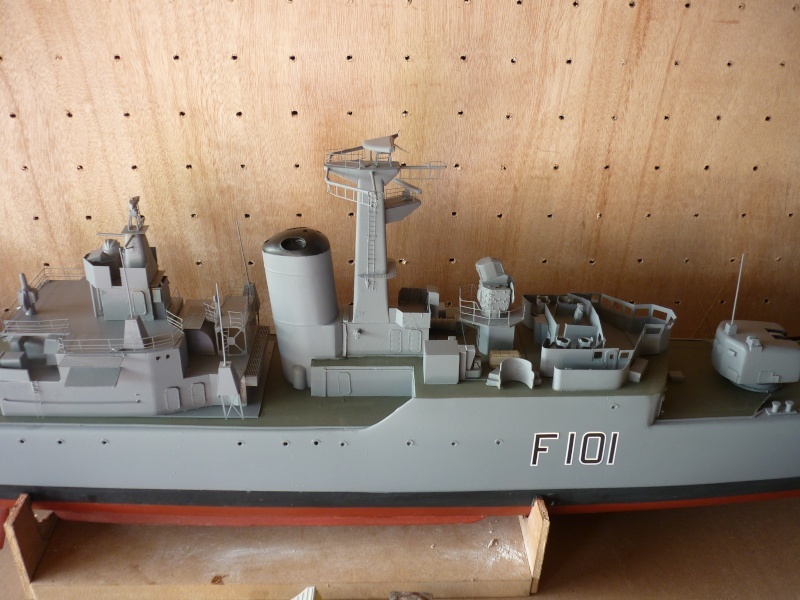 I started to build HMS Yarmouth Type 12 a few days ago using the Cammett hull and I have taken a few snaps of my progress todate. So far the sandiing and drilling has been done but as I build her (slowly) I will be posting up a build log with some commentary but nothing to detailed. When I get time tomorrow I will start with the photo log and wife willing there will be no gardening and I can do a little more tomorrow. Well despite taking a number of pics and doing a few hours work this morning - Dog woke me at 5 for a walks!! - I am having trouble uploading pics into the blog. Hull rubbed down and made good where there are imperfections in the hull. Openings drilled out and filed to size. gaps filled and now as of this morning sanded down and made good. Underwater detail such as machinery space grills fitted. 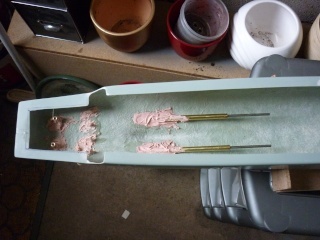 Started to make bilge keels. Stabilisers ready to be drilled and fitted. Then SHE called for me. Topic Tided Up. Photo Upload Issues Resolved. Okay this was the basic Cammett Hull before starting. Although the hull overall was good, as with a lot of hulls it did require some filling and making good in one or two places. 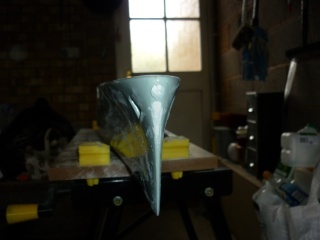 So a couple of nights of filling then sanding was required but not too much of a difficult job. After this started to make the openings. 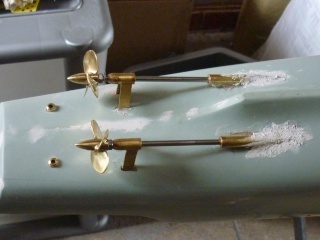 A few scuttles and the shafts, a frame and rudder post openings. 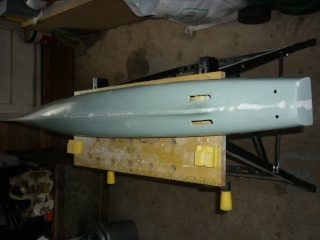 Prop shafts, A Frames and Rudder posts now installed with epoxy and excess space in gaps filled using filler. When checking realised a still needed to some more sanding down of the stern as it wasnt as square as I would like it ready for the deck to be attached. Test fitted the rudders and everything looks okay. The thrust collars have been test fitted but arent shown in the pic. The running gear is from G Sitek. And very nice stuff too george. Looking good so far, it should encorage me to get back to my build. Well so far I have posted the work up until yesterday. This morning thanks to an early rising dog I spend a few hous working on the next stages. Sanded smooth the excess filler around the shafts and a frames and rudder posts. It may not look it in the pic but it is smooth!! Just didnt clean it up before I took the picture so there is mounds of FG dust around. Started to fit the underwater detail of machine hatch openings as can be seen. I had also started on the stabilisers and bilge keels but before I could do any more there was a pipe for the Permanent Sea Fence Party to close up to fix a fence panel that had just blown down in the wind and rain we are having here in North Bristol. So its the end of todays work. Hopefully I will finish off the underwater bits next weekend and post some more updates then. 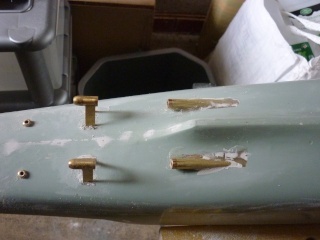 Have now drilled and pinned the stabilisers to the hull and epoxy in place to hold them in case of knocks. Couldnt quite work out the angle from the plans but they are in the righ positions and the angle if it is wrong will hopefully be a help in keeping her a little stead as this is going to roll I expect. 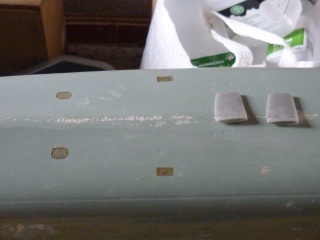 I have cut and shaped the bilge keels using plasticard and will epoxy in place in a couple of nights. Will post photos of this at the weekend. Then enxt job is to make the shelf for the motors battery and esc. Will be running two 540s and using independant VIper 15amps for each motor powered by two 7.2 packs. Now fitted the porthole eyebrows which was a pain and fiddly to do - think one is still in the dogs dinner bowl!! Most of the underwater stuff is now done. 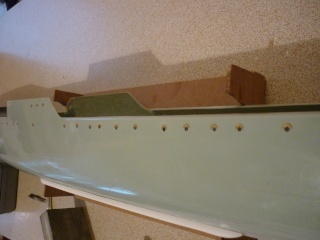 Rudders and props now correctly fitted with colletts but they will again be removed for painting. 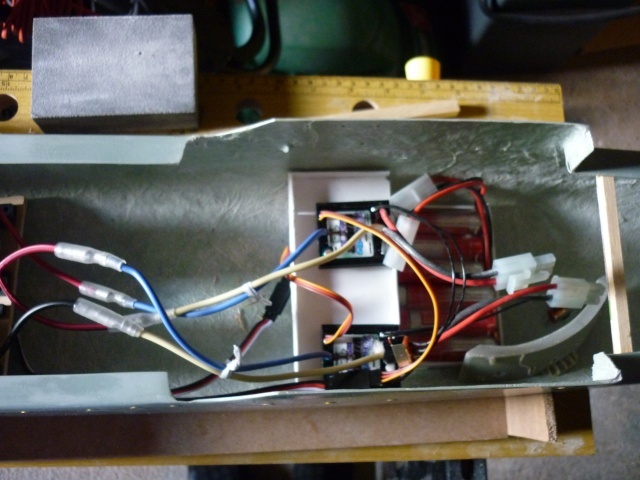 Have made the battery boxed ready to fit in and the shelf for the motors is in place and mounted the servo so will give a test run over the next couple of days then its on with the decks. I have build the batter box and receiver shelf etc and was going to fit today and try a test run of the shafts but I thought id do some work today in the comfort of the house instead so I have gone a litttle bit out of sequence and started to do some of the basic work on the bridge. I hope to have the bridge assembly with the GD platform that adjoins it done at basic level of the next couple of days with the extra detail to be added at the appropriate time. The internals can wait until next weekend. 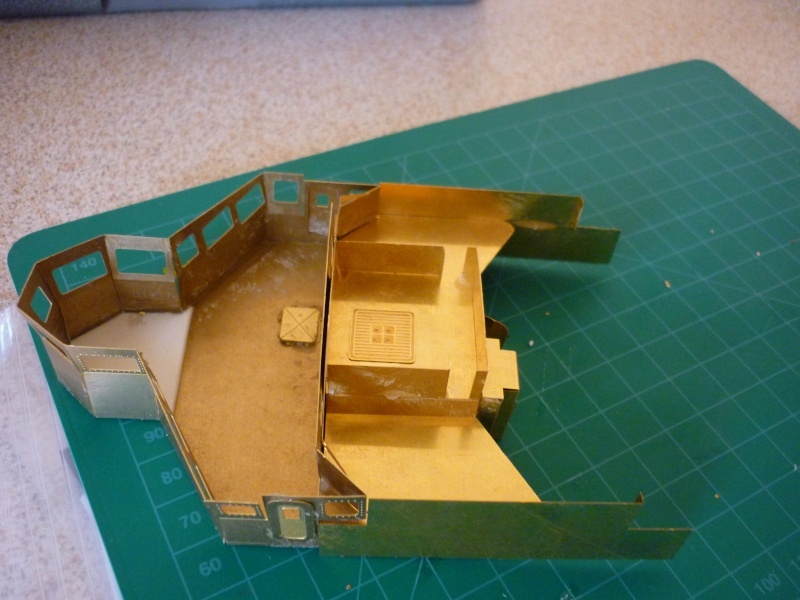 The etched brass sections of the bridge have gone together better than I was expecting and is very lightweight so hopfeully when painted it wont look too bad and will keep the top weight down a bit and help give a more stable sail. the brass looks good. how do you join it? is it soldered together ? Just bonded with medium super glue. After the initial bond ran a small .25 evergreen strip around inside to increase the bonded area. 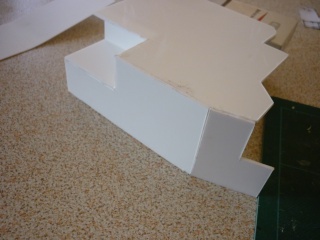 There are a couple of very tiny gaps between one or two sections so I am going to just tin slightly on the inside so it would fill the small gap and hopefully when painted and filed it will be a clean smooth joint that cant be seen. Motor shelf is now in situ with the motors and couplings in nice and straight but with the battery box only temporary located but I havent bonded the box in yet as I want to do some float testing to make sure its in as good a position as possible for ballast and for access. One access hatch will eb the hangar over coamings and the other will be located by making the deck area around the Maing GWS Director or the GD and Bridge deck removable. Bridge is completed apart from the bridge roof which will be added later at painting stage. I am in two minds whether to furnish the bridge interior or not. It does look neat when completed but once its sealed its a bugger to see anything!! I have also made up the GD platform that butts onto the rear of the bridge. Pics of this latest work will be posted later. GD Platform almost complete - just needs the end folds curved to complete the join. Once painted it should look pasaable. Is reasonably sure it will look good with paint. It looks good now. Are you going to make interior as well? or will it be visible in very small degree? The boat looks great! Can't wait to see it together! Don't want to ask a silly question, but those props look huge to my eyes? Is that the recommended size? Not sure about the interior - as I posted earlier 'I am in two minds whether to furnish the bridge interior or not. It does look neat when completed but once its sealed its a bugger to see anything!! WIll think about it this weekend. I ahve also started the Main Director Platform as its a kitchen job. Well to be honest. If it will be impossible to see what's on the bridge. I would have let it be as it is. Otherwise you would have to tell them that looking at the model, how many hours you have used. In creating the interior. And they will think here it comes again blah blah blah I can not see anything. It is difficult to have an opinion about something you can not see. Exellent !!! ..... looking forward to more updates. Well made some more progress yesterday. 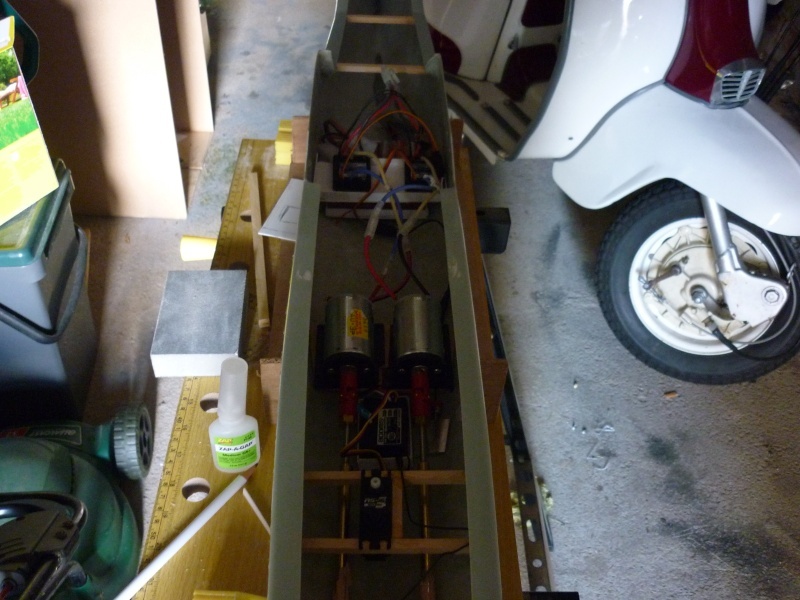 All the internals are now in place - rx, rudder servo, ESC's and Batteries. Everything has been wired up and checked the weight distribution in the bath and its level with the internals placed where they are in the pics. Some little bit of more ballast will be required to get her at the very limit of her waterline but I will do that later. After the float test I stiched her on, set up the ESC's and tried the engines. Relieved that there were no glitches with the ESC's and they worked nicely in unison using the Y lead with one of the BECs disabled. Even feathering the props with just a light touch of ratchet they do turn over equally from an eyesight perspective so hopfully she will sail okay when the props turn over in the water. 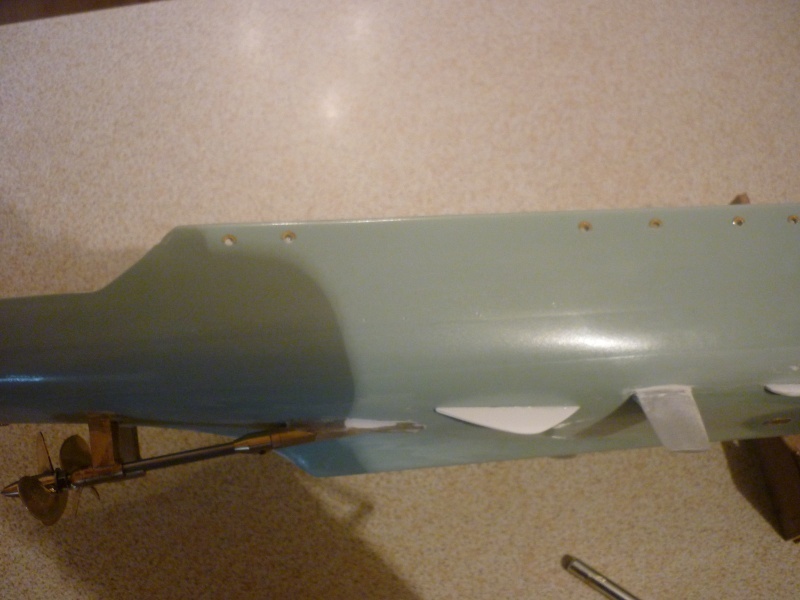 I havent yet linked the rudders to the servo but that will only take a few minutes. Also need to tidy ub the wires as they are chaos at the moment but nothing a few wire ties wont cure. For access I am going to have a small hatch over the rudder tubes that flits flush on the QD, the hangar will be on a coaming to lift off which will provide access to motors and there will be a further opening on the bridge deck. Havent quite decided on where this will start and end but will figure that out when I start cutting out the deck plastic and try the bridge and GD platform on for position. I have also made a start on the support ramin beams on the foc'sle - I will put a small plastic card lip just under the FG rounded deck edge of the hull to make it a smooth fit and to give a base for any filler required between the joints. 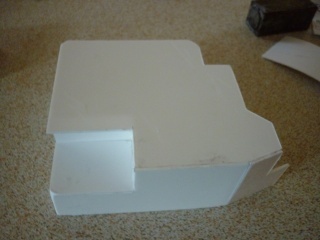 Normally for a square box I would build it round the coamings to get a nice snug fit but the shape precludes this. I have measured the width against the hull and the hangar coamings will be an exact fit against the deck edges of the rounded side of hull moulding if that makes sense so it will be easy to make the deck opening it that makes sense. Well it makes sense to me now but I might have an oh my god what did I do moment later in the build!!! As the plan shows starboard view, plan view, hangar end looking forward but not port of hangar lokoking aft there are some prrts that cant be done by template but will need to be 'sized' as the build progresses. Having cut the templates I have made a start, commencing witht he roof and also internally a former the sahme shape as the roof. 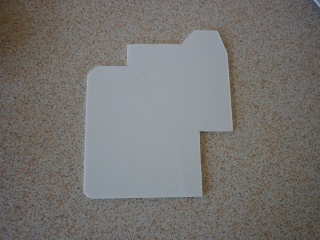 Having cut this then attached the first side and so forth. After a few pieces cut and glued the basic shape is starting to come together. A bit rough and untidy and obviously a lot of sanding and cleaning up to be done but fairly pleased so far. I will leave it 24 hours now to fully set before starting the port side and then forward end of the actual hangar and then the platform that supports the emergency steering position and whip arials. Making some progress on the hangar superstructure over the last couple of nights. The basic structure is now completed and I have started on the detail although there is a long way to go. Started with the hatches and the secat director housing and also the aft mast. Going to start on the air conditioning units and vents later today assuming its still raining and some super detailing of fuse boxes and telephone exchanges etc. . Whoopee. No need to be dragged round the shops by SWMBO. Have also made some progress on the decks in that I have now got most of the deck bearing beams installed and all decks apart from the furthermost focsle and the QD are now cut to size ready to be permanently placed. Still a long long way to go but she is starting to resembe a little bit a Type 12. Due to family business I wasnt able to make much progress this week but I did manage to spend a bit of time on her yesterday but the few hours of work I did seem to make her look as if I spent a lot more time than I actually did!! Although the foc'sle and QD were roughly cut they needed a fair bit of timming and I had to finish installing the support beams for the QD. These are now done and the fit isnt too bad - will just need a little bit of filler to bridge any gaps and some sanding to fair in the deck with the edge of the hull. 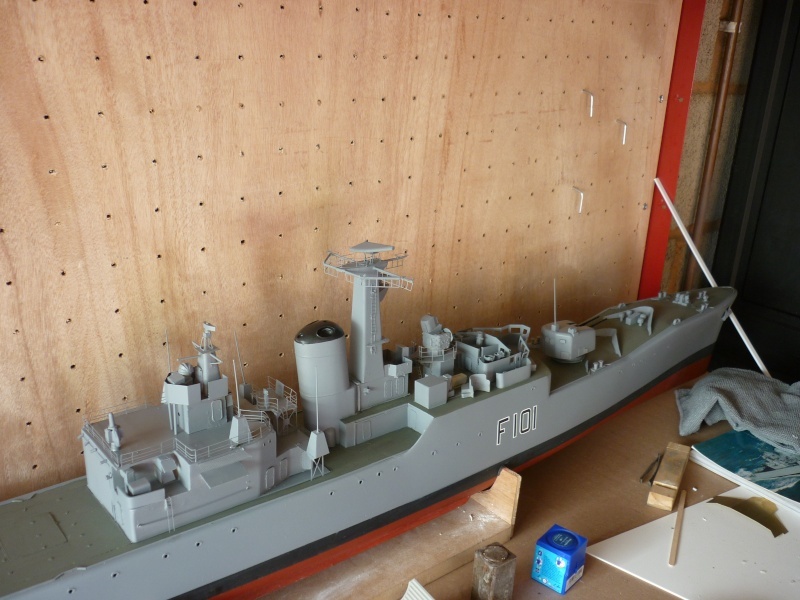 The Midships bridge deck was cut but I hadnt made the cut out aft to wrap around the funnel. This is now done. I still have to make two cut out access openings for the batttery tray and the tiller arms and I will do these over the next couple of nights. Gave her her first float test this morning - watertight which is the first concern. She is also fairly level and stable at this point but obvioulsy riding a little high at the moment sitting below the lower WL marked position and there is a lot of weight to go on yet. However even though this weight of fittings will add to the top weight I think she will have enough margin to be ballasted down to be stable on the water. Time will tell!! Having cut out the decks I have dried fitted all the bits I have done so far and I dont think she is looking too bad so far. Looking more and more like a Type 12 and starting to show some of those gracious lines I always thought the type 12s had. Yeah thanks for the warning Phil. I was aware - I found this out a number of years ago with my first attempt at soldering when I thought it was a clever idea to hold to bits of brass with superglue and then tin!!! Ahem, shall we say I learned my lesson but I appreciate your warning - shame I didnt have it 10 years ago might have saved myself a few tears caused by my dumb naivety. Didnt half feel a bit of a wassock. 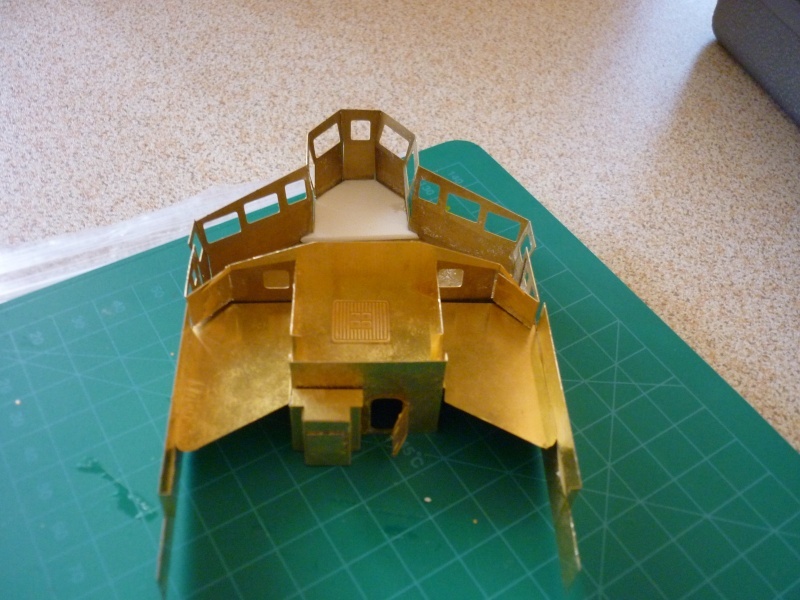 The small gaps I have are devoid of glue and I will be attired protected and fanned when the time comes. Painfull init mate! sorry my warning didn't come in time still hopefully someone else who didn't know may now be able to avoid the danger completely. Decks finally trimmed to as close as I can get so the epoxy will be out early Saturday morning and will be bonded to the supprts and main hull. Also painted the lower red lead hull and the boot topping so will post piccies at the weekend as by then she will be looking like a grey funnel line proper but in refit!! Havent had the chance to do too much over the last 3 or so weeks due to other commitments but the last week has given me the chance to make more progress. All the decks are fully done now. The funnel is permanently in place and the deck housing and watch station for'd of the funnel is made and in place and the bulkheads around the waist and funnel boxed in. Breakwaters are now in place and anchor chain handling plates are on. The limbo well deck is now being boxed in with only the starboard side to do which I will complete tomorrow. 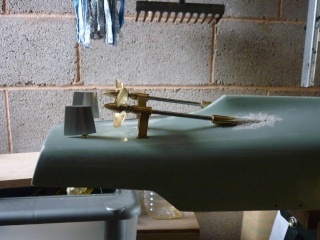 I will also make a start on the mast fittings tomorrow and do some further detailing of the hangar. The mast is a bit daunting as there is a large amount of brass work on it for yards and ECM arrays and ladder rungs etc but hey ho I will see how it goes. All in all its starting to look more and more like a ship in refit and is becoming more and more recognisable as a Type 12 Frigate. Not ever going to be museum quality I know as I fall into the category that someone a lot more talented than me said was the 90% of modellers who blame suppliers for faults rather than themselves!! Had a bit of a gap in building due to holidays which is sad but the copious amounts of Mythos beer made up for the sadness in being away from home (!!). Got back to the building this week and decided to make a start on the foremast mast and got quite a bit done and quite pleased with how it is turning out. Needs some cleaning up but hopefully the finished results will look decent once cleaned and painted and in place on the mast house. Still got some more detailing to do on the main mast but it is getting there overall and more and more looking a litte bit like what she is supposed to look like. And as it is sadly raining and I am heartbroken I cant help SWMO in the garden I will also have a couple of hours in the garage later this afternoon and return to the hull detailiing which will be the Limbo well includng the Limbo ramp and Limbo platform. Tomorrow I will complete the foremast building and with luck spend some time on finishing the smaller mainmast yards. Nice to see you back on the build Intrepid, it's looking good with a lot of nice brass work. Well one step forward and two steps backwards!! I have put a couple of hours or more in over the last week and added some more detail and so forth. 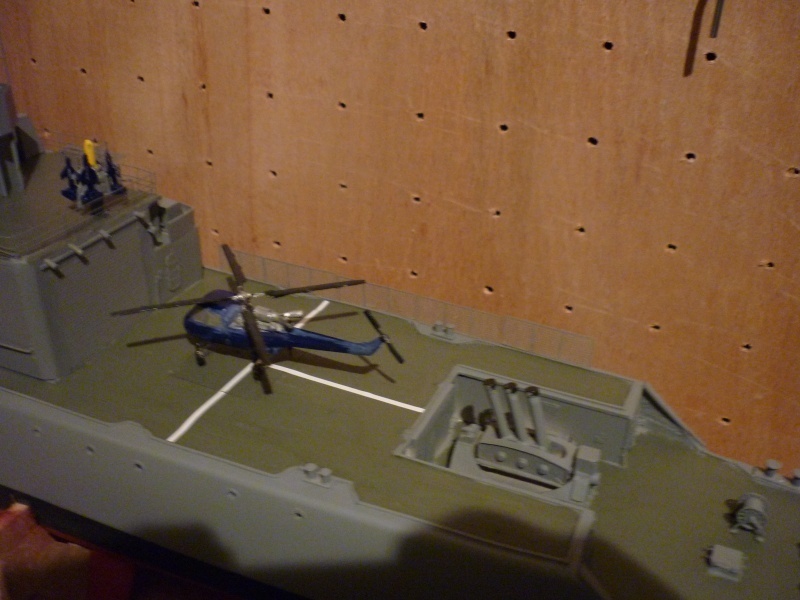 Hatches, WT doors, Limbo well detail, scupper foot rails, flight deck tie downs etc and thought it was making progress. Then disaster. An Irish Setter did what Argy Mriages and Skyawks couldnt and destroyed the fore mast!! Much remedial work to be done as etched brass and a hard floor dont mix. 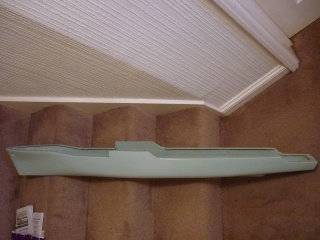 Careful straightening and bending back into place is required. The wife would have gone if it was her but I do love my dog so thats life. Limbo was the ASW Mortar that followed on from the Squid and was fitted mainly to Leanders, Types 14 and 15 Frigates, Tribals, Whitbys, Rothesay and Bristol. Couple of others also had it - Scorpion to name one. Well a few other bits and bobs done here and there but the main progress is starting on the main painting. 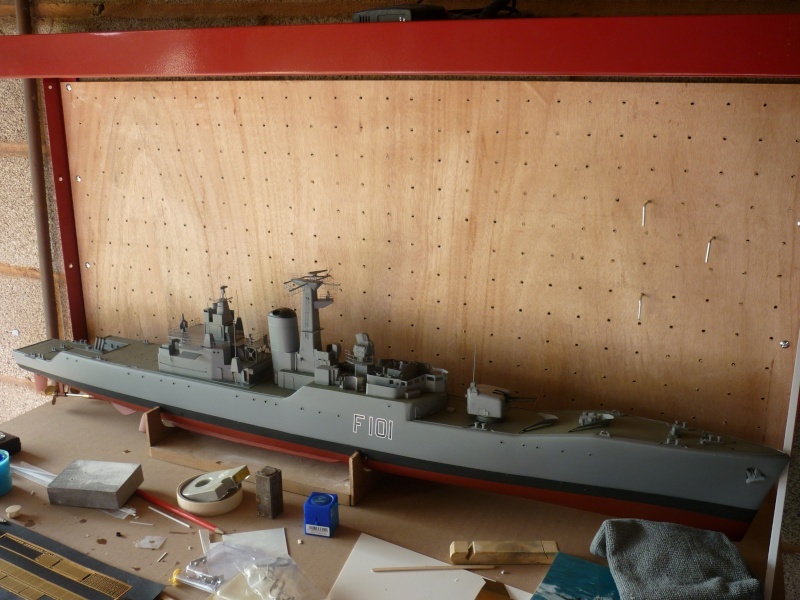 I know some people like to go for the exact chip colours for exact likeness and hard to knock that but me being a bit of a philistine I always think that Halfords Grey Acrylic is close enough for me to resemble grey funnel line ships. 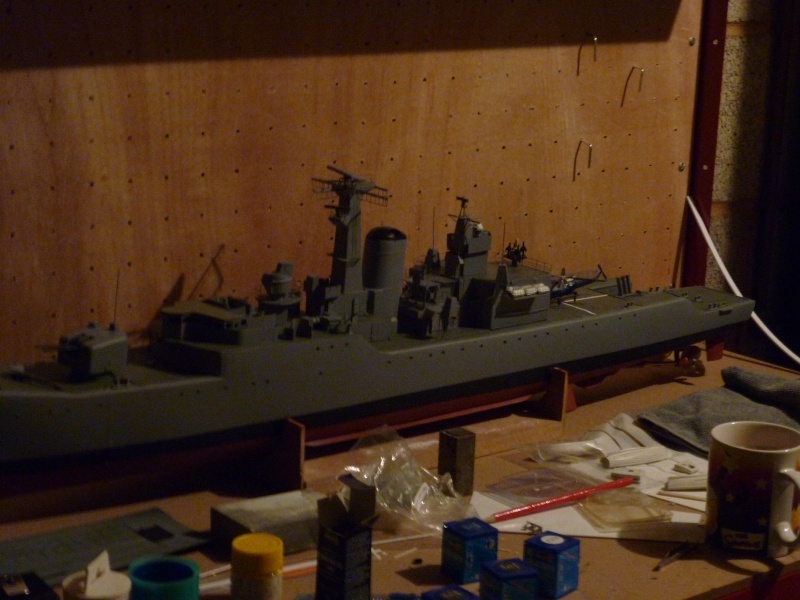 Just got to the first coat of the main hull but its coming on and looks better even with just one coat. 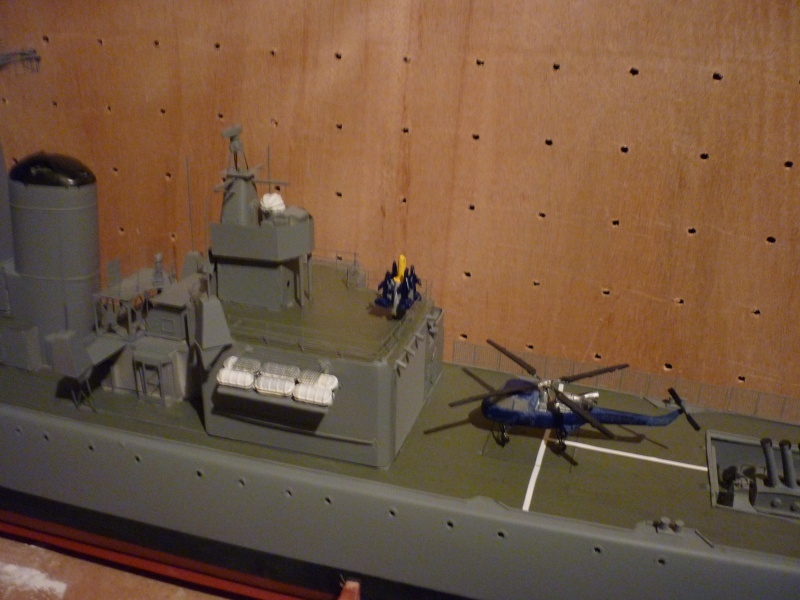 The mast, Hangar, and Director will be painted seperately. The decks will also get the Halfords Acrylic Gre treatment but then will be over painted with darker Humbrol Acrylic Dark Sea Grey to be as close to a 1970s 80s deck colour as possible and will hand brush this on. The remaning fittings will be painted then added. Another few weeks and she should be completed. I think!! I hope!!! Well had some time this week, last weekend and today to make some progress. Mast is virtually done now, some finishing off needed at the end by fitting the birdcage etc but essentially its done. Main hull painting is now complete. 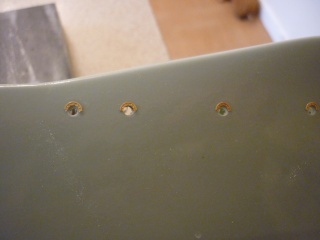 Not too happy with the decks and where they join the round hull side flange that is part of the moulding. I did that twice at the start and couldnt get it right and thought it was pretty good but as always paint doesnt just hide mistakes it shows inperfections 10 fold!! But it will have to do. I dont build museum quality (by skill level or lack of it and not by choice) so this is gonna have to be it. 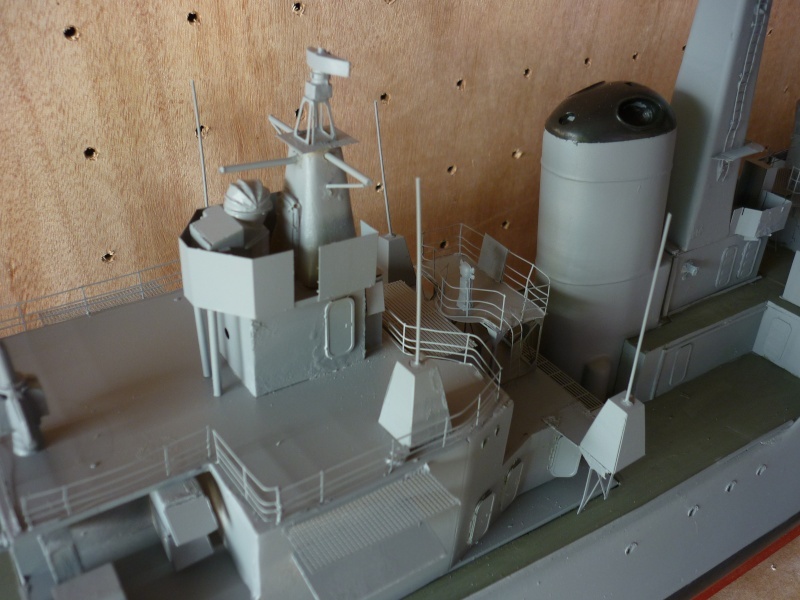 There isnt a lot left to do now - I need some time on finishing the hangar detail such as hangr FD lights, Sea Cat pipework etc and I will paint her off the model, then a few other fittings including the corvus, the 20mm etc davits and ships boats. I ahve a shed load of old Deans vac forms I was going to use but Im tempted to be lazy and splash out on quaycraft. Paint the deck and the deck markings round the 4.5 area and then finally the 4.5. Almost there. Then decide what to build next!! . Its getting there. I did a couple more hours since then but havent taken any pics - will put up at the weekend. Seacat missiles now painted and in situ, Oerlkons now painted and in situ. 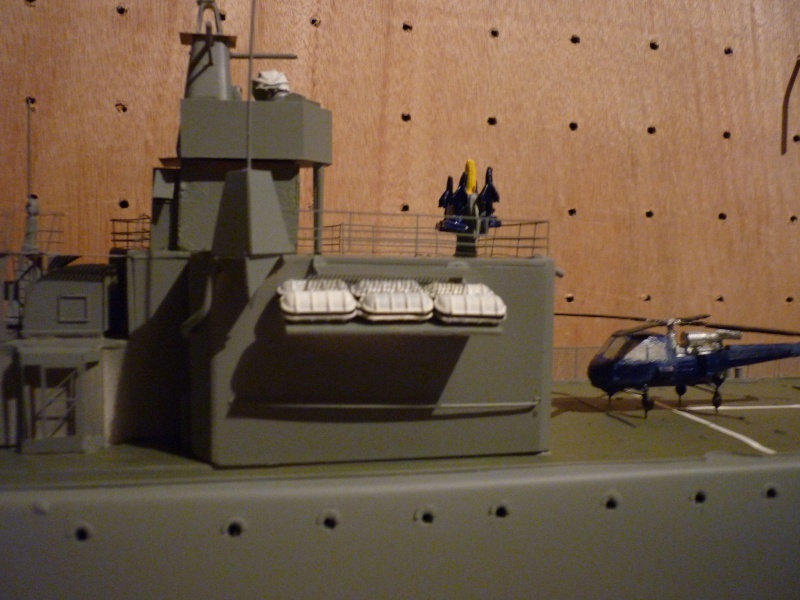 Fittings such as cable reel and motor winches all painted and in situ and flight deck markings now painted on. 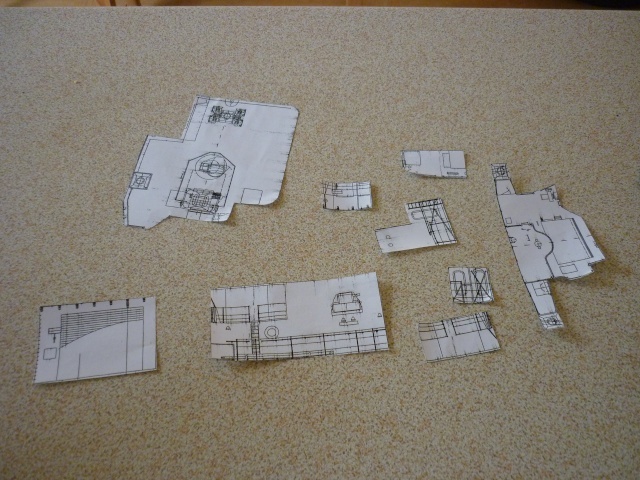 Printed off deck markings for turret and seacat launcher on decal paper so will put that on tomorrow night. 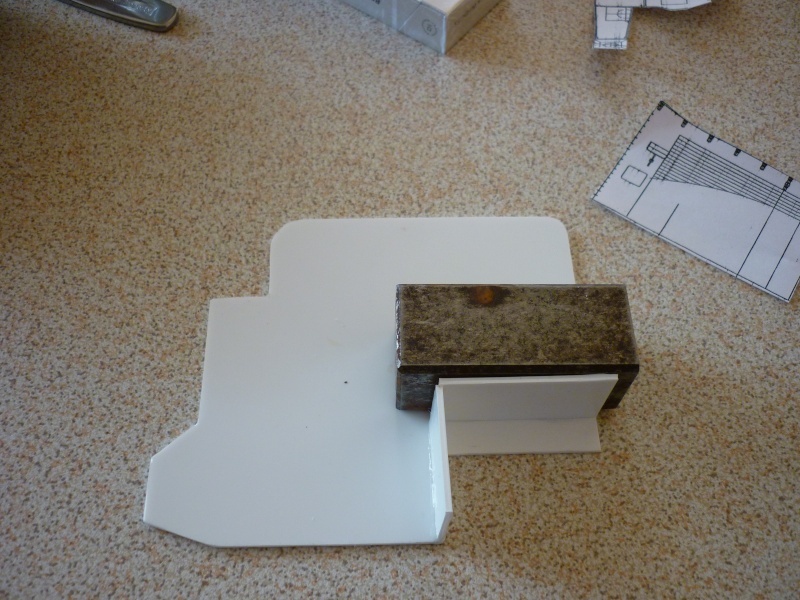 Liferafts, ships boats and davits, corvus fitting and painting at weekend is the plan. Then jsut leaves the birdcage top of the mast and the stanchions and we are just about done. Oh and the brige roof and glazing at weekned. it certainly is......I always feel sad when I have to cover brass work up with paint, , but your model is looking really lovely. Thanks for the very kind feedback. I have seen a lot better builds than what I can do with my limited skills but I am happy with how shes turning out. that's the main thing,............as long as you are satisfied with what you have done.it matters not a jot what others think in the long run. build for yourself and your own satisfaction and you will never be disappointed. Well managed to get some time in yesterday and today after having a disrupted last week travelling to the North East to sort out my father in laws ill health, and having to miss a damn good run ashore in Brum on remembrance day with some old oppo's toboot, and now getting to the point where there is a lot of fiddly bits to do, those last few bits where you think its almost done then realise theres something you missed. Not quite at the point where she is finished but the end is in sight. Have fitted half of the life rafts and am in the middle of putting on the flight deck markings with the Y M and the landing spot cirlcle to go over the centre cross. One side of the fligh deck side netting is also on. A half hour each night over the next 2 weeks and she will be ready for a first sail on 4th December. It will be then be time to move to another build.